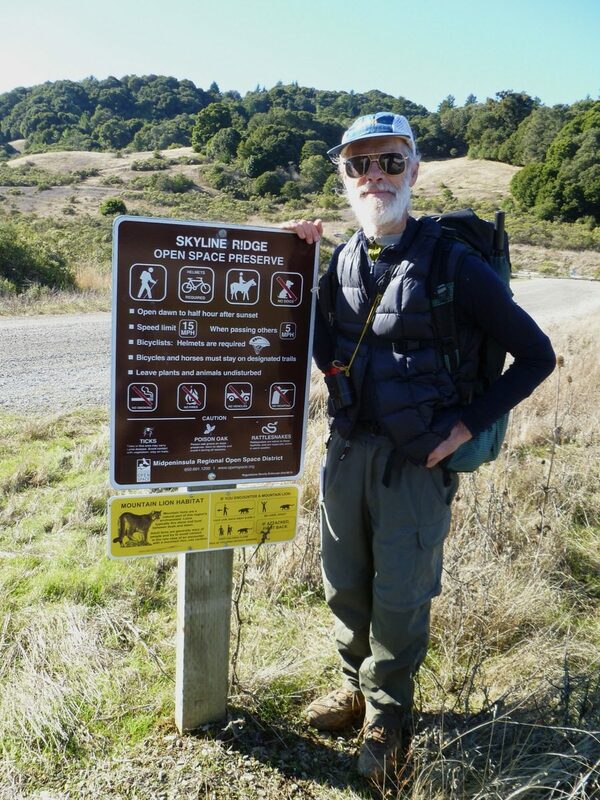 Information about using public transit to access trailheads in the Bay Area. 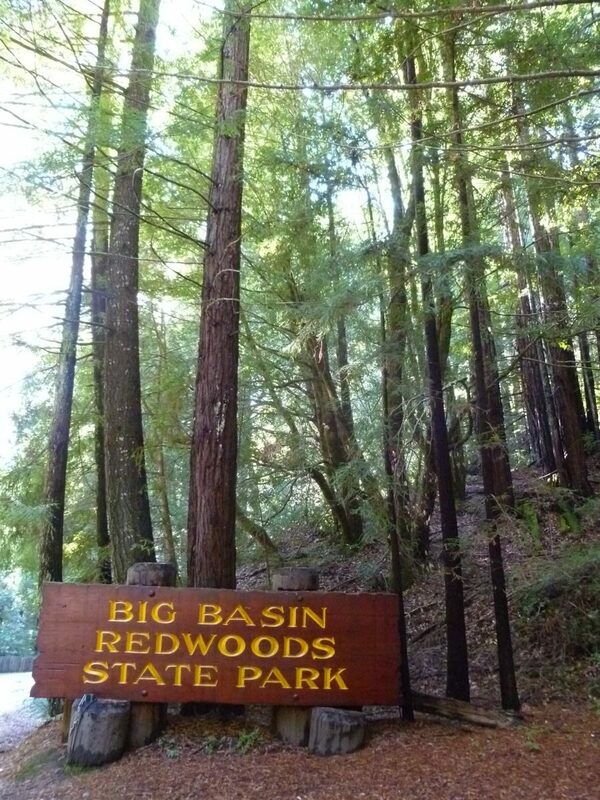 California State Parks has information and maps for Castle Rock and Big Basin State Parks. 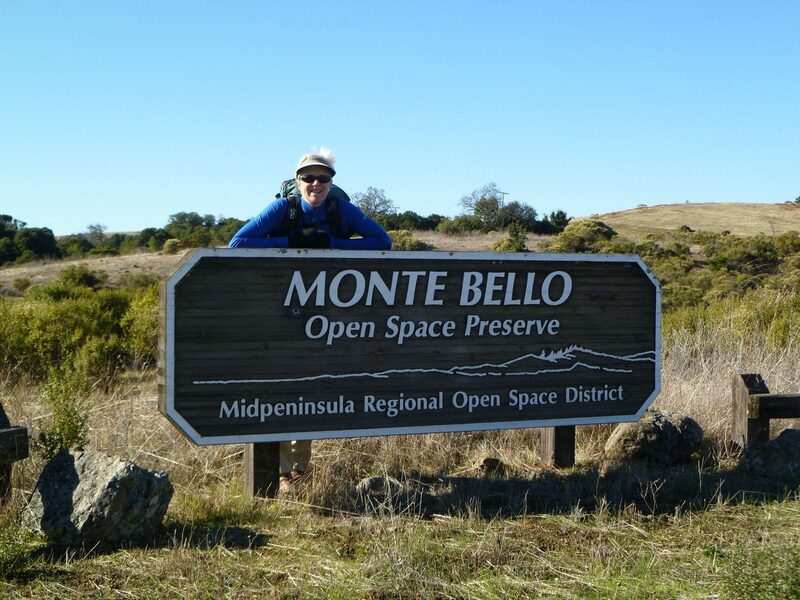 The Midpeninsula Open Space District has useful maps. 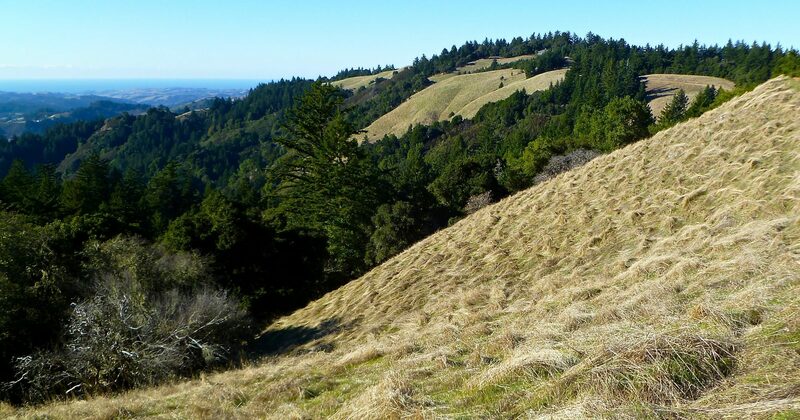 Two National Geographic Trails Illustrated maps cover the entire hike: Big Basin, Santa Cruz; and Skyline Boulevard. 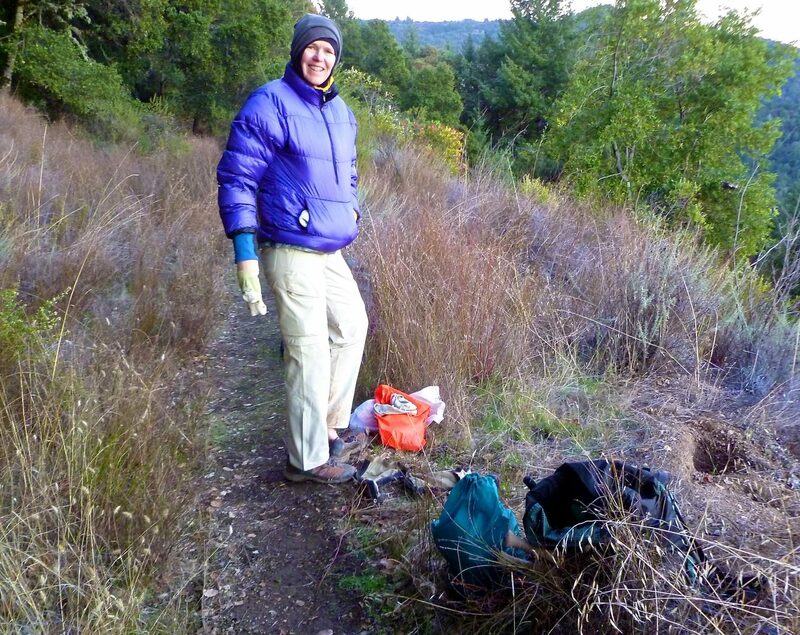 Local backpacking opportunities are one of the benefits of living in the Bay Area. 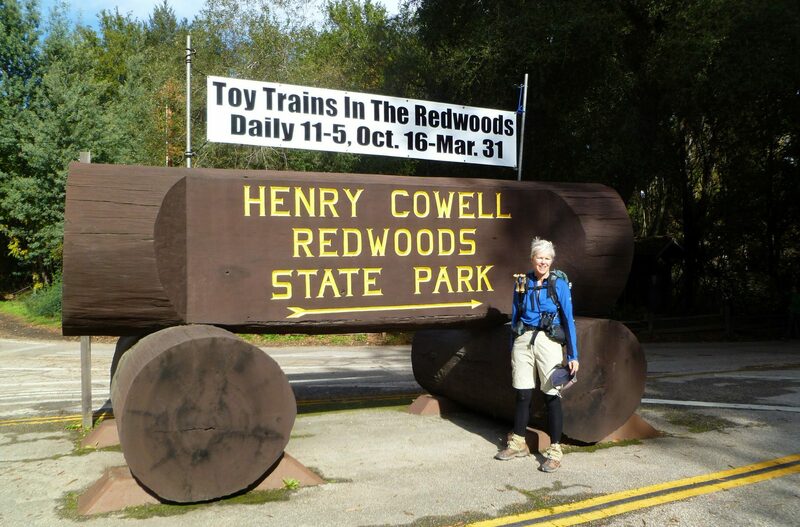 We have taken a couple of different loop hikes from Palo Alto to the coast and back and we have walked the coast from San Francisco to Santa Cruz. We like maps and have a large collection of them. Studying the maps, we realized that we could create another local route that makes use of public transit to reach the start and end points. We have a tradition of taking a three or four day backpacking trip near home over the Thanksgiving weekend. November is in our rainy season, and we only go if the weather forecast is good. 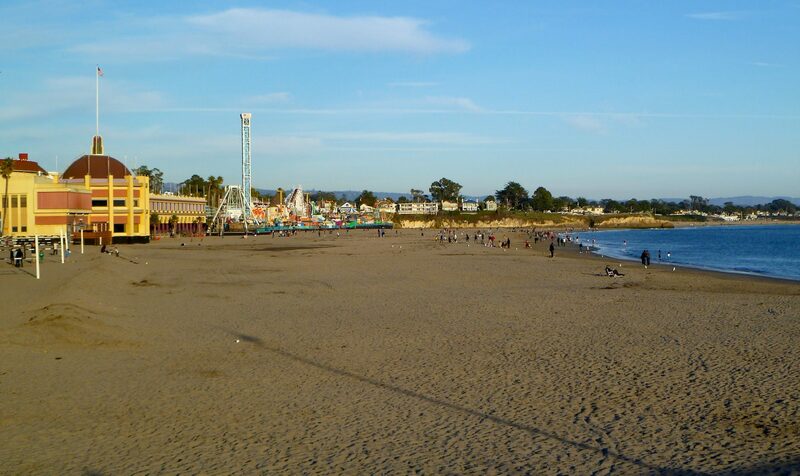 The forecast was for clear cool weather, so we took advantage of a break in the rain and walked to Santa Cruz. 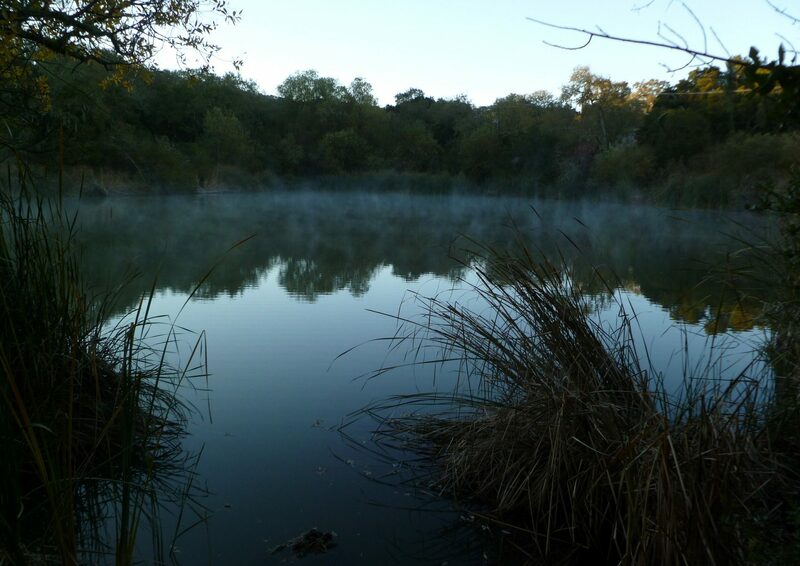 There is a small pond in Arastradero Reserve which often has a few waterbirds. A nice Great Blue Heron was there that morning. The moon was waning on this trip. Mt. Diablo on the left. 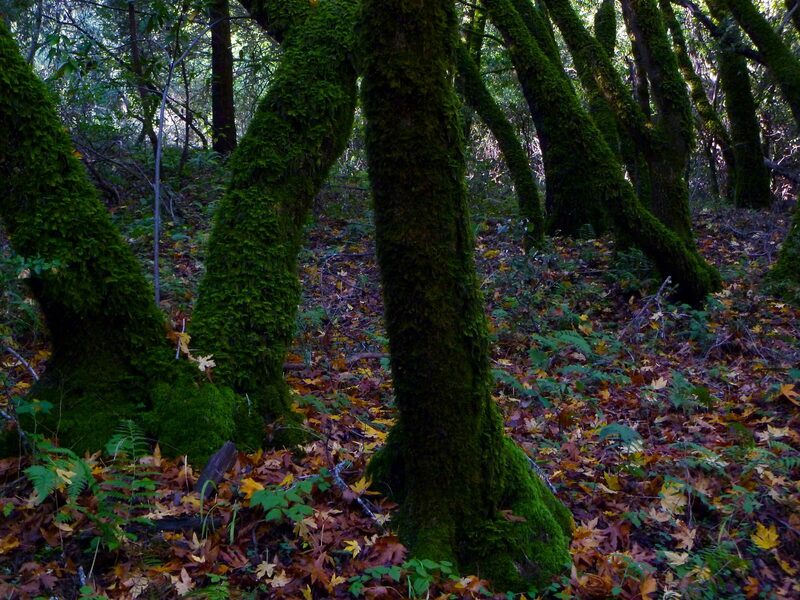 The tree moss was responding happily to the recent rains. 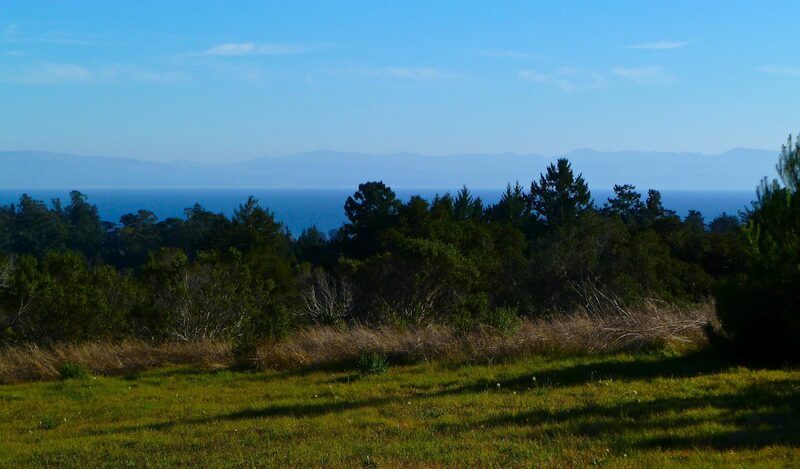 The Pacific Ocean in the distance. We filled our water bottles here. We set up camp along the Toll Raod Trail near an opening in the woods with a nice dinner spot with a view. The days are short this time of year. Late afternoon, climbing up a trail to Eagle Rock. Someone built a terrific footbridge. 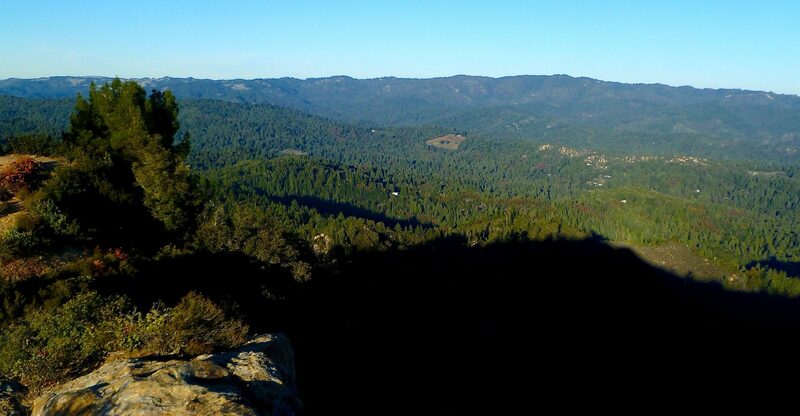 At Eagle Rock, Skyline Ridge in the distance. There is an old fire lookout here which has been attacked by the locallouts and marked with lots of graffitti. But the views are great and there was a flat space to set up the tent. 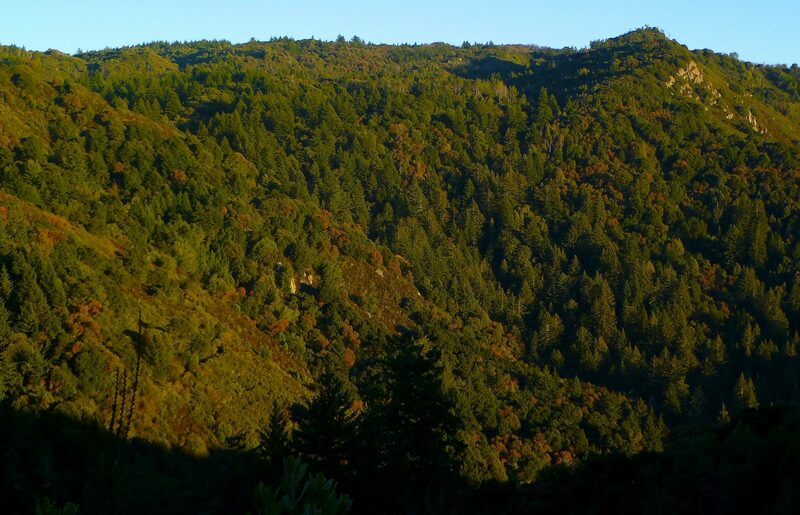 The area was mixed first and second growth Redwood. 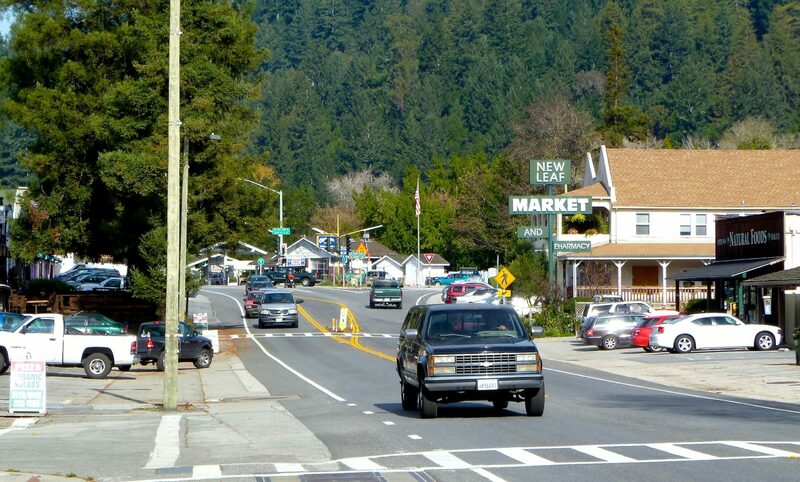 We walked out of the south end of Fall Creek into Felton, an old logging town in the San Lorenzo Valley. Felton now is full of laid-back types and crystal shops. 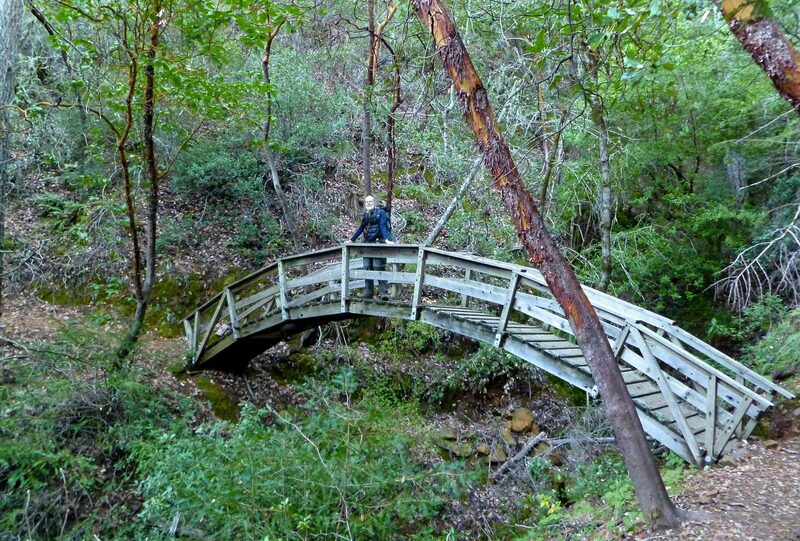 Into the next part of Henry Cowell State Park. San Lorenzo River, which enters the sea at Santa Cruz. There used to be Coho Salmon runs in this river, but the fish are now gone. Monteray Bay and the mountains of Big Sur. Finally the beach. The entire walk was about sixty-five miles. By Bay Area standards it was cold, with temperatures in the 20s at night, and the last day of the hike was a record low for many nearby towns. But the skies were blue and the air was clear and it was great to be out walking. The Farallon Islands were clearly visible 60 miles away! 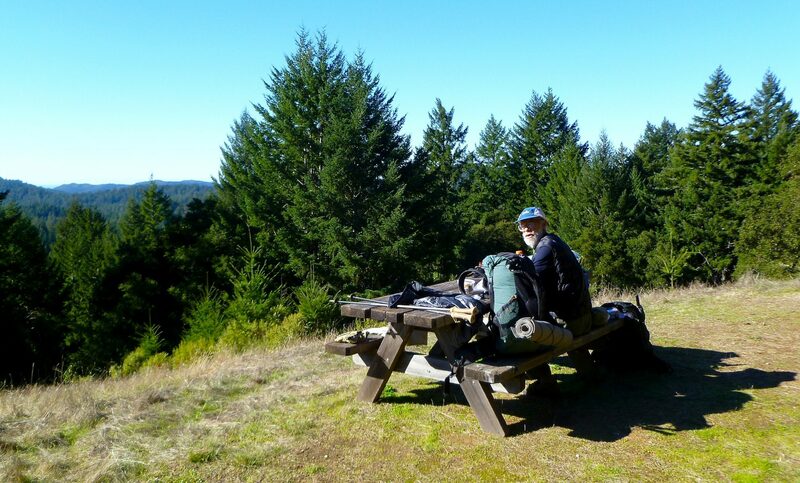 Most of this hike is in second growth Doug Fir and Redwood forests, with occasional grassy clearings that provided fine views of the bay and the ocean. 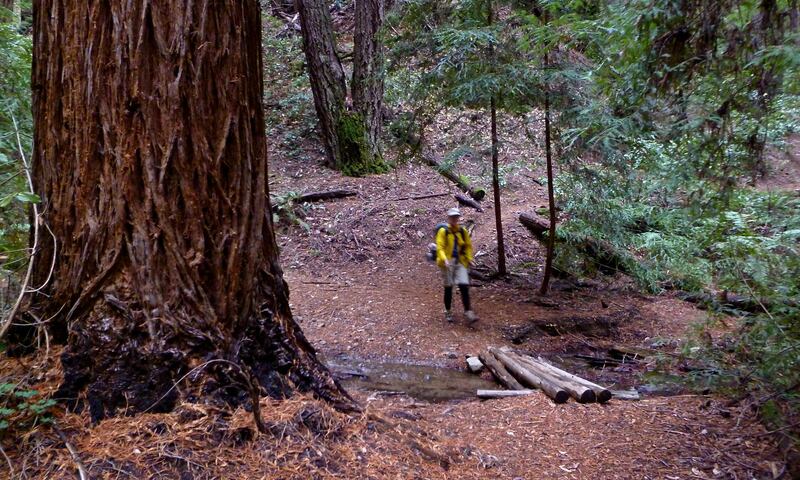 There are a few stands of old growth redwoods in Big Basin State Park. I love public transit backpacking. This was a nice easy walk on our home turf. For me, it is satisfying to leave the car at home and still be able to take a long hike. I also enjoy piecing together this kind of route as it reinforces just how much public land we have in an urban area with over 7 million residents. This wasn’t the most fabulous hike I have ever taken, but it is much better to be out than not. 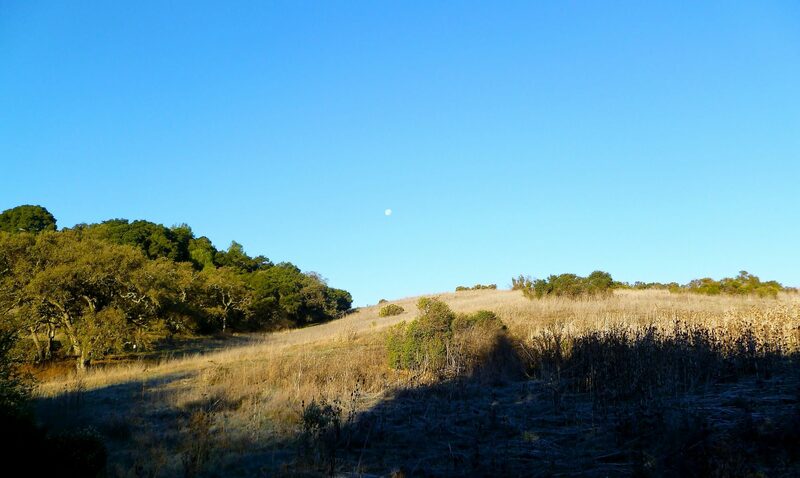 We took a local bus from home to the corner of Arastradero and Deer Creek Roads in Palo Alto, the closest we could get to the trailhead by public transit. 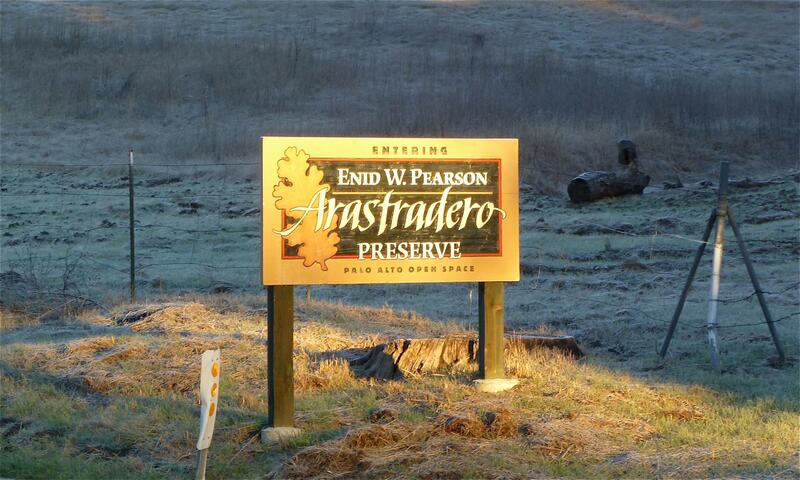 From there it was a 1.75 mile walk on rural town streets to Arastradero. Six miles are on county roads, mostly on the Empire Grade Road and then a short piece of Felton Empire Road. Empire Grade Road has very little traffic and we have mapped an alternate that takes you off the last piece and onto even lesser used Alba Road. 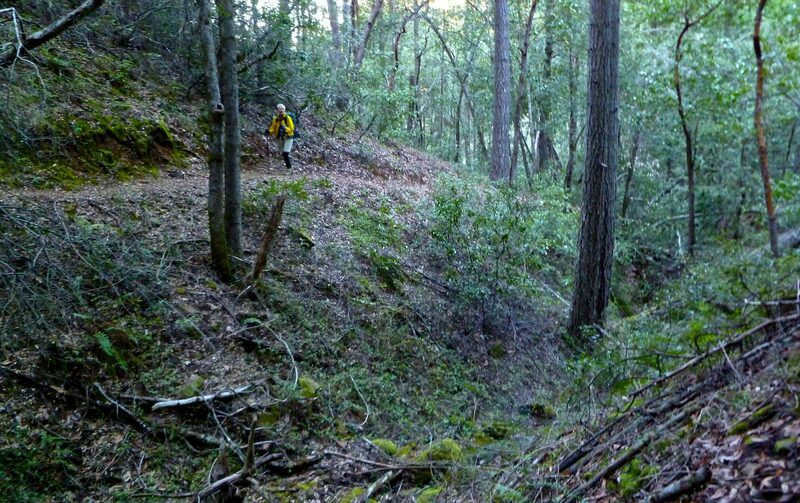 Sometime in the future, the yet to be opened San Vicente Redwoods property may provide a trail link eliminating almost all of the walking on Empire Grade Road. 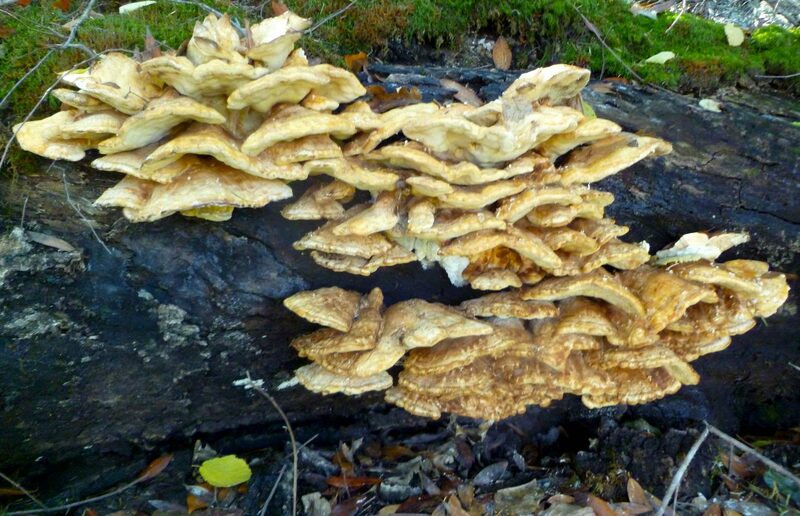 A consortium of environmental groups purchased the 8,500-acre property for habitat preservation and eventual public recreation. Upon reaching Santa Cruz we walked to the pier instead of going straight to the bus station, and therefore walked 3 miles on Santa Cruz town streets. After stopping at the Pacific Ocean, we walked back to the transit station and grabbed a bus to the San Jose CalTrain station and then took the train home. 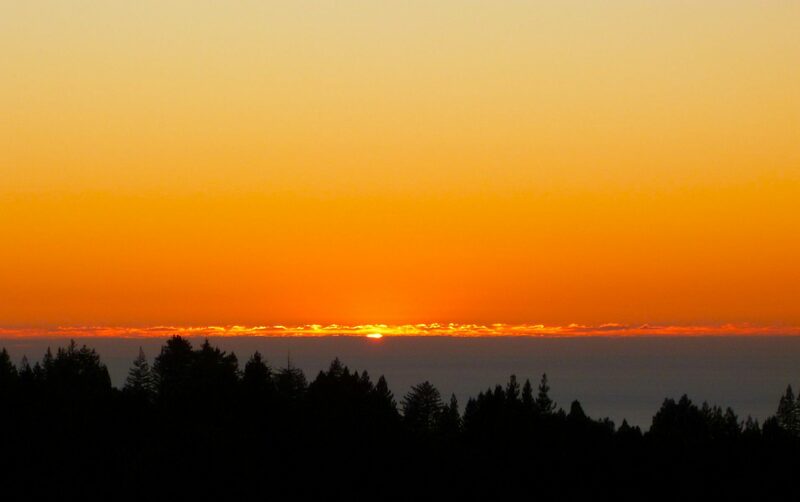 There are a number of alternate routes between the Los Trancos OSP parking lot and Saratoga Gap, where Highway 9 crosses Skyline Boulevard. 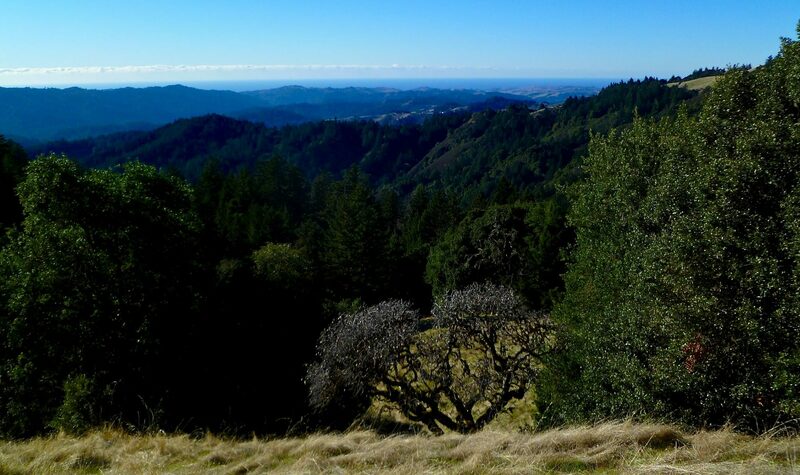 We dropped down and walked through Steven’s Creek Canyon, but you could also stay on the ridge and walk south on trails parallel to Skyline Boulevard. 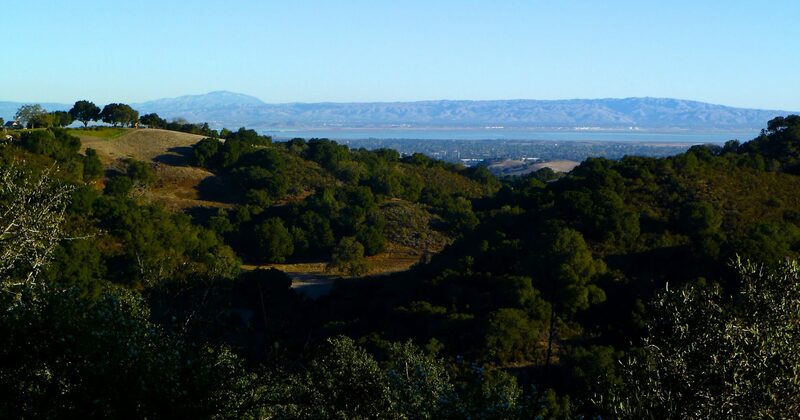 We recommend taking the Sawyer’s Toll Road Trail instead of the Skyline-to-the-Sea Trail south of Castle Rock. Skyline-to-the-Sea closely parallels noisy Highway 9. The Toll Road Trail is further from the highway and below it, so most of the traffic is inaudible. Also, very few people use the Toll Road Trail. 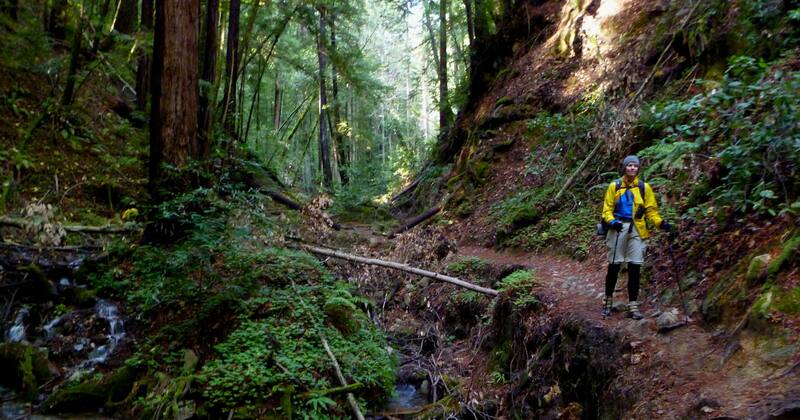 Big Basin also has a network of trails and our route is only one of many that could be pieced together in the park. In 2019, we made a few improvements to our original route. These are included in a separate folder in the Caltopo map. These improvements move some of the road-walking to less busy streets in the Palo Alto foothills, along Empire Grade Road, and in the Felton area. We have also changed the route in Santa Cruz to follow the fine riverfront bike path down to the sea. 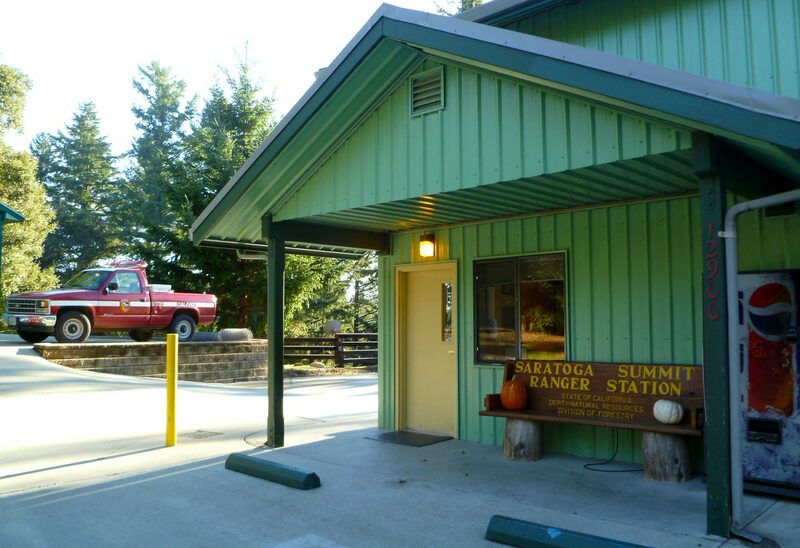 Water is usually available at the Cal Fire Summit Station just prior to crossing Highway 9. The trail passes directly below this station, but there is no trail connection and access requires a short steep scramble. 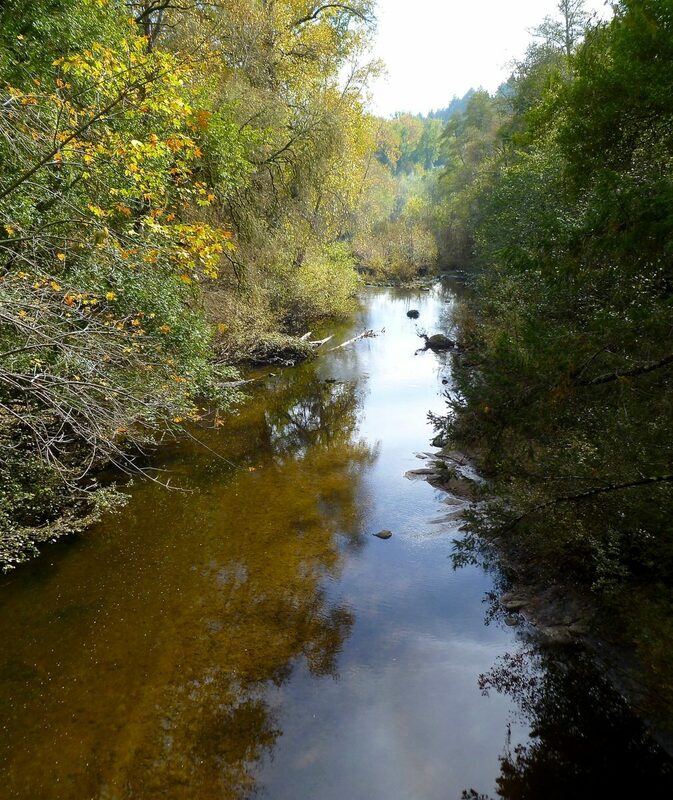 We had to wade one stream at the southern end of Henry Cowell State Park Redwoods Unit. When we were there the water was about knee deep and flowing quite slowly. It is probably possible to hike this route staying in legal designated campsites, but we like to hike all day and stop when the sun sets, and designated campsites were not in locations that worked for our itinerary; therefore we stealth camped. Palo Alto Foothills Park is closed to non-residents with vehicles, however anybody is permitted to walk into and through the park on foot from Arastradero Preserve or Los Trancos OSP.